What is it with PC Manufacturers appending the word "one" on their PCs? First it's the Gateway One, and now it's Dell with their Dell XPS One. Anyways, there's only one thing I can say about the Dell XPS One--WOW! If the Dell XPS One is as gorgeous in person as it is in the pictures, I would be tempted to get one. Though there's something cute about the Macs being in white, I have always preferred by gadgets to be in black. The Dell XPS One exudes style and power with its looks. The Dell XPS One's specs are not bad either; 20 inch widescreen, wireless keyboard and mouse, built in web camera, Bluetooth, TV tuner, and speakers, optional Blu-ray disc drive, Core 2 Duo, the works! Come to think of it, the Dell XPS One kinda really looks like the Gateway One only with a more edgy feel. 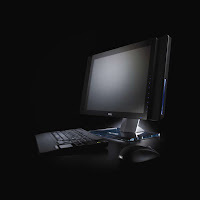 For the complete technical specifications, visit Dell's website. The Dell XPS One is now available for pre-order with a price range of $1,499 to $2,399 depending on the specifications you choose.